Caribbean Living Magazine was gifting a seven-day stay to one of three assorted sea resorts to choose from. You can see all of the resorts they feature at www.caribbeanlivingmagazine.com. Roger Dubuis watches were on-site offering a great display of their Haute-Horlogerie Swiss Manufactured line. Their designs are incomparable to any other watch, and are equipped with a highly complicated, intricate system which allows you to keep perfect time. Grab your man one today at www.rogerdubuis.com. Garth Fisher MD, of Biomed Spa of Beverly Hills, brought items from his customized skin care and facial treatment plans for guests to take home in a gift bag. You can read all about Biomed Sap and their comprehensive laser treatments, photo facials, laser hair removal, micropigmentation for scar camouflage, customized “anti-aging and wellness” evaluation for “counter-aging” supplements and hormonal support, as well as their Visia computerized facial complexion and skin analysis services at www.garthfisher.com. Teen Wolf’s Crystal Reed and friends. 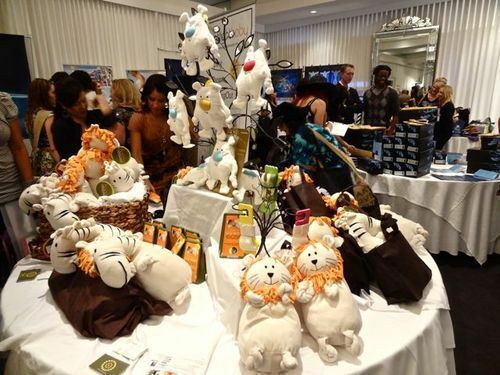 Raquelle Bianco was offering exquisite jewelry for the guests to admire and take home with teem. Bracelets that open with ease and cuffs that fit perfectly on any wrist, ranging from black and white accented design to bold blue with rust and yellow tones, these bracelets were definitely a favorite among the crowd. You can find your perfect piece at www.rauellebianco.com. 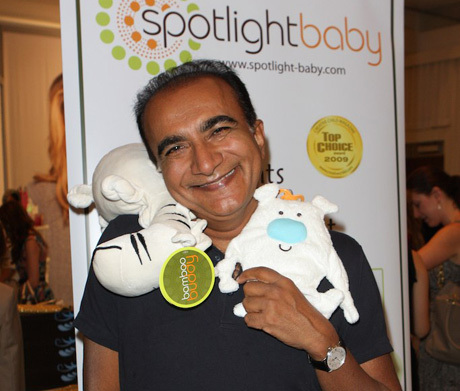 Spot Light Baby was introducing their brand new product that will change the world of pacifier holders. having a stuffed animal attached for added comfort to sooth a child, with added links for little fingers to play with and all organic material that could not be softer. Spotlightbaby was founded by occupational therapist Judy Kang, who as a mother, simply wanted more out of a toy for her child. Her “Squees-Ease” no-scratch mitts, which prevent babies form scratching themselves while promoting sensory development, are just one onf many innovative products to check out at www.spotlight-baby.com. Body Beautiful Canada was founded in the early 1990′s and has been offering specialty spa products including the Universal Contour Wrap, Eurowave, and Hartur Ultrasound to clients for over fifteen years. You can find them at www.bodybeautifulcanada.com. 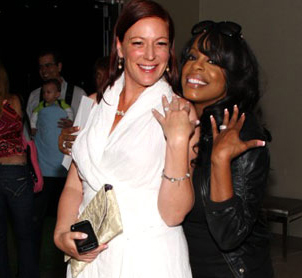 Secret Room Co-creator Rita Branch and actress/comedianne Niecy Nash flash their engagement rings. Homanz, founded by Shirley Tsang, is a beautiful line of luxurious bags which encompass simplicity in a high fashion way, and never looses the classic styling and timeless value. 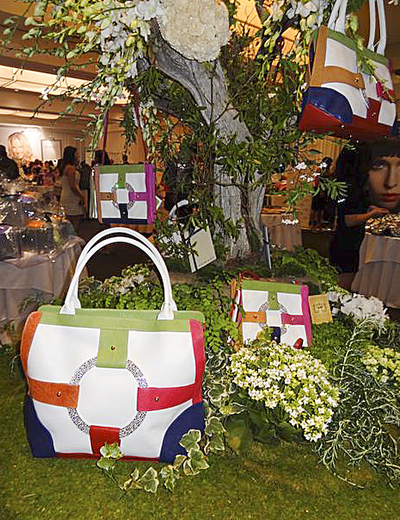 Incorporating bright colors and unique accents, a Homanz bag is a delightful addition to any purse collection. Shirley Tsang was on-site letting the stars pick out their favorite style of the latest line to take with them. Find your new bag today at www.homanz.com. 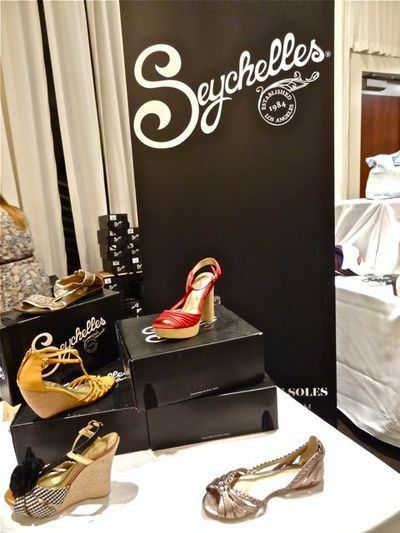 Shoes By Seychelles brought along their latest fashion in shoes to gift to celebrities and special guests. Their vintage inspired heels ranged from yellow leather wedge to black stilettos, and were a huge hit among the crowds’ elite. You can add a touch of vintage to your closet atwww.seychellesfootwear.com. Cailyn Cosmetics from Smile World, is a leading mineral cosmetics and skin care line, and were offering guests two loose shadows of their choice which could either be mixed with the lip balm mixture for lip color, or applied over the eyeshadow primer for eyes. You can find all of their metallic and bold shadows at www.cailyncosmetics.com. Peel Technologies Inc, brought their latest technology that can turn your iPhone, iPad, or iPod Touch into a personalized TV guide. It learns your preferences, and finds the television programs you watch the most, saving you the time of scrolling through pages of content. You can grab your Peel and get start getting your tv guide personalized at www.peel.com. Million Dollar Tan, founded by Lindsay Dickhout, has spent the last ten years tanning the stars. Lindsay has refined the priceless formula herself, making sure you get the perfect amount of tan every time you spray. Get your Million Dollar Tan started today at www.milliondollartan.com. Marne Jaye Art had pieces of her collection hung for the guests to enjoy. Her uses of patterns and colors and inciting and her designs are a sure fit as an accent piece for any art lover’s wall. She was gifting an 8×10 picture of the guests choice, as well as greeting cards featuring her designs. You can find a list of shows and galleries her work will be featured in at www.marnejaye.com. Sushi Style introduces an entire line of products where art becomes functional. Inspired by sushi rolls, their ottoman line was created to resemble sushi fillings, using bright and vibrant colors for accents. Ottomans are complied of several pieces fitting together, and can be separated for additional seating. The company is divided into three sections featuring the Style Collection, which is more casual design, the Signature Collection, which is more sophisticated, and the Sushiami Collection which is designed for children. You can see all of the latest sushi inspired furniture at www.sushistyle.com. Rev 7 Gum is the world’s first environmentally friendly gum. It is “high quality” gum without he added bonus of being removable and degradable. Check out the brand from the UK-based Revolymer at www.revolymer.com. Teen Wolf’s Tyler Posey gets a Thai massage from El Leon Spa. LA Splash Cosmetics had an array of bold and bright sparkly colors to introduce to the guests. They were handing out silver makeup bags filled with product for guests to enjoy. Check them out at www.lasplashcosmetics.com. Nys Collection Eyewear offers premium sunglasses without premium oricing. They were founded in 1996, having only one retail location in the World Trade Center in New York City, and now have more than 10,000 retail locations worldwide. Snag a new pair for summer at www.nyscollection.com. Boogie Wipes is well known among the parenting community as a life-saver kleenex that actually works. At times, most have even thought, “Man, I wish there was a product like this for adults.” Well, now there is! 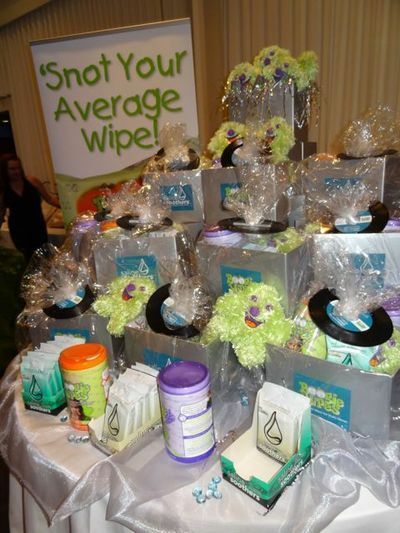 Boogie Wipes was on location to launch their latest convenient product, Saline Wipes for adults. They are offered in chic package that can slip inside you purse or fit nicely into a console in a car. Boogie Wipes were gifting a gift box including Grape or Fresh scented Boogie Wipes, an adorable stuffed animal, and their latest Saline Wipes. You can check them out at www.boogiewipes.com. Robin-Ruth is a company we have all seen about town, that features different city names upon all of their merchandise. The brand is being represented in 22 countries around the world today, and products range from hats to purses, from scarves to socks, each dropping the name of the customers favorite city. You can find your favorite city to rock on the streets at www.robin-ruth.me. Gabbita, from South America, offered a wide display of eveningwear, swimwear, and sophisticated little girls clothing for guests to admire. Details such as hand beading and unique appliques enhance femininity, and make Gabbita’s crochet and knitting an incredible wearable work of art. You can find a store near you or see their collections at www.gabbita.com. 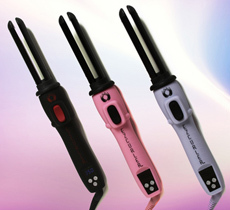 EZ Curler has been seen on TV as the curler that makes precision curls easy. They were gifting the celebrities and special guests with an EZ Curler to take home and try in a lovely gift bag. You can grab one for yourself at www.EZCurler.com. Real Resorts were offering an all inclusive package for celebrity guests, featuring their top-of-the -line services including a personal butler and privacy enhanced set up that allows room service to be slipped in through a slit in the door without ever bothering the guest. Spa services included as well as private pools and balconies. Book your next vacation and learn to travel like a celebrity at www.realresorts.com. Rebootizer USA is a detox shaker that provides seven all natural ingredients to help you back on your way to feeling great. 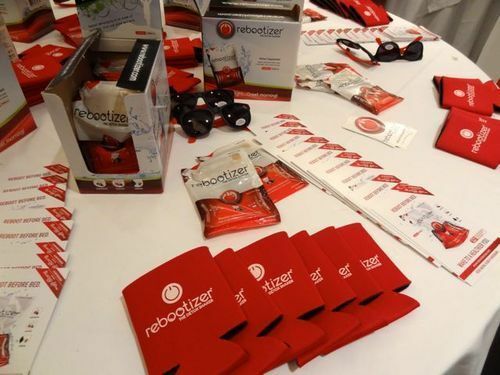 Rebootizer is packaged in a convenient pack, so there is no measuring or need for something to pour it into. All you need to do is squeeze the bag to pop the seal, shake it up, tear the top, and start drinking. YOu can read all about the benefits and grab a weeks supply for yourself at www.rebootizerusa.com. FloraGLO Lutein, sourced from marigold flowers, is the world’s leading patented purified lutein, and is used to help maintain healthy eyes and skin. You can find out more about the benefits of FlorGLO and where to buy products at www.floraglolutein.com. Secret Room’s Rita Branch with fiance Volodymyr Udoveychenko. Celebrities also received pre-packaged gift bags containing products from Jan Sport Bags, We-Vibe, Agape & Zoe Naturals, Illy Issimo, Way Hierarch Cute, Lareiki, Justins Nut Butter, Make Love Not Trash, Poo-Pourri, Hand To Heart Jewelry, Sugar Rush Creations,Passion Parties, Cohoots Handbags, Romeo & Juliet Couture, Lulu’s Garden, Chef Stef Candy Co., It’s a 10 Hair tending, Amore Grace, Susan Ciminelli Day Spa & Salon, Minsley Inc, BodiBronze Sunless Spa, Thorlos, Vi-Peel, Price Point/ Section 8, Sappho Organic Cosmetics, Oogies Snacks, Yum Nut Naturals, Soy Joy, Fabuutous Chikks, Waialua Soda Works, El Metropolis Spa, Goody Good Stuff, and BlueAvocado.